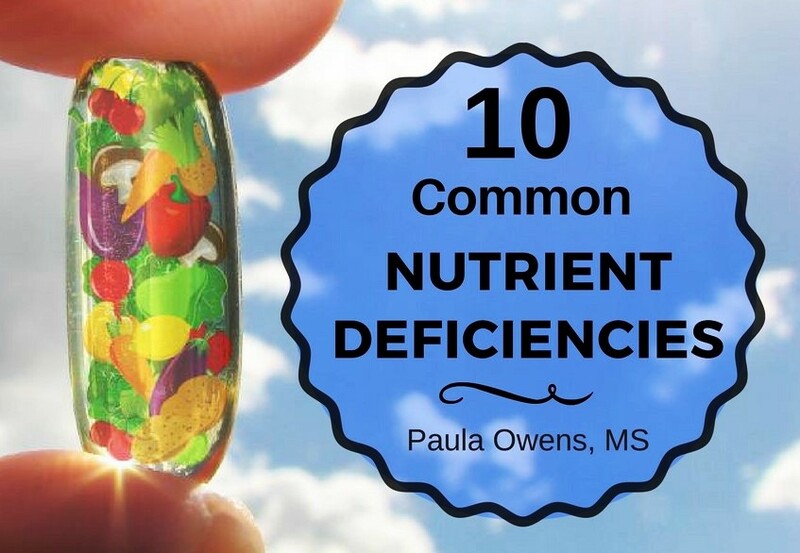 Nutrient deficiencies are increasingly common nowadays. A deficiency in any single nutrient can affect thyroid function, hormone production, energy levels, metabolism, mood, memory, the appearance of your hair, skin and nails, and the overall condition of your health. Increased risk of dementia, heart disease, depression, osteoporosis, and cancer can be attributed to nutrient deficiencies. Nutritionally-void diets secondary to poor food choice. People are under-nourished, yet overfed (nutrient density is missing). Eating non-organic foods. It’s important to shop for organic, nutrient-dense and locally-grown foods. Non-organic foods, fast foods and all processed foods contain little (if any) vitamins, minerals and nutrients and a chemical cocktail of glyphosate (a mineral chelator), pesticides, herbicides, GMOs and toxic metals. Mineral-depleted soils and poor quality agriculture caused by failure to till under soils, rotate crops, or use natural fertilizers. The vitamin and mineral content in fruits and vegetables have declined up to 76% from 1940-1991. The heavy use of chemical fertilizers, glyphosate, herbicides and pesticides have damaged the soil of vital nutrients, and destroyed the healthy and necessary microbes that plants need in order to absorb the minerals. This has caused many common fruits and veggies to have significantly fewer vitamins and minerals today compared to 50-70 years ago. Alcohol depletes essential vitamins and minerals that your body needs to function properly including vitamin B6, folate, vitamin A, vitamin C, thiamine, riboflavin, pantothenic acid (B5), magnesium, and zinc. Thiamine metabolism is greatly affected by alcohol intake, especially heavy drinking. Alcohol also inhibits the liver’s ability to produce digestive enzymes, which makes it difficult for the body to absorb proteins, fats, B vitamins and fat-soluble vitamins. Inadequate chewing; fast eaters tend to have severe digestive ailments, malabsorption problems and several nutrient deficiencies; they also tend to overeat in attempts to satisfy their nutritionally-depleted status. Stress and environmental factors. High stress lifestyles cause several nutrient deficiencies, specifically B vitamins, zinc and magnesium. No one is drug deficient — just nutrient deficient. 1. Essential fatty acids (EFAs) and omega-3 fatty acids are highly beneficial for the prevention and treatment of cardiovascular disease, dry skin, eczema, psoriasis, autoimmune diseases, neurological conditions, cognitive disorders, cancer, inflammation, Crohn’s, hypertension, asthma, PMS, menopause symptoms, hormone imbalances, weight loss resistance, ADHD, anxiety, depression and other mood disorders. 2. Vitamin D is a steroid hormone we get from sun exposure, food and supplementation. Vitamin D deficiency is a risk factor for immune dysfunction, cardiovascular disorders, hormone imbalances, aging skin, wrinkles, sarcopenia, osteoporosis, autoimmune disorders, insulin resistance, depression, anxiety, psychological dysfunction, Parkinson’s disease, skin cancer, breast, prostate and other cancers. 3. Vitamin B12 is needed for every cell in the body. It’s involved in normal functioning of the nervous system and immune system. Vitamin B12 is necessary to prevent accumulation of homocysteine, a toxic metabolic byproduct linked to cardiovascular disease and connective tissue problems. Vitamin B12 deficiency is very common in the elderly, vegans, vegetarians, those who avoid animal protein and those with MTHFR defects. Hypochlorhydria and GI problems are frequently linked with vitamin B12 deficiency. Symptoms of Vitamin B12 deficiency include fatigue depression and mood disorders, weakness, anemia, memory loss, sore tongue, irritability, dementia, tinnitus, brain shrinkage, neurological problems, and an increased cardiovascular risk. 4. Vitamin B6 (pyridoxine) is critical for emotional health, and important for protein metabolism, growth, and the nervous, endocrine, and immune systems. Vitamin B6 deficiency can increase the risk for depression and impair cognition, attention, and memory. Exposure to smoke, pollutants and chemicals is detrimental to B6 status. B6 deficiency is associated with higher levels of inflammation, oxidative stress, poor blood sugar control, elevated homocysteine, and an increased risk of colorectal cancer. Symptoms of B6 deficiency include pain, inflammation, numbness, hypochlorhydria (low stomach acid), inability to recall dreams, joint stiffness, carpal tunnel, sensitivity to bright lights, tingling extremities, sore tongue, depression, cracks in the tongue, lips and corners of the mouth, and anemia. The liver needs magnesium and B vitamins, particularly B6 to detoxify xenoestrogens. Alcohol intake dramatically increases the need for vitamin B6, as do certain antidepressants, hormone replacement therapy, oral contraceptives, diuretics, corticosteroids, and some drugs for RA. 5. Folate is responsible for repair of DNA and making of red blood cells. Folate deficiency symptoms may include swollen or sore tongue, mouth ulcers, insomnia, fatigue, anemia, nerve damage (peripheral neuropathy), headaches, heart palpitations, cognitive issues such as brain fog, forgetfulness, depression, and behavioral issues. Folate deficiency is also linked to methylation problems, elevated homocysteine, coronary heart disease and cancer. 6. Thiamine is involved in energy metabolism and functioning of the nervous system. Psychological stress, hypoglycemia, adrenal hypofunction, alcoholism, low stomach acid, and severe fatigue indicate a need for thiamine. 7. Magnesium is the considered to be the anti-stress, relaxation mineral. It’s involved in energy metabolism and responsible for over 300 enzyme reactions in the body. The cardiovascular system, nervous system, muscles, kidneys, liver, brain, hormone-secreting glands, and GI tract all rely on magnesium for their metabolic function. Those who experience anxiety, insomnia, high blood pressure, muscle cramps, headaches, constipation, insulin resistance, fatigue, irritability, memory loss, stinky feet, PMS, COPD, alcohol withdrawal, restless legs, and diabetes often benefit from magnesium supplementation. Magnesium requirements may also be increased by diets high in protein, fat, sugar, and alcohol. Decreased absorption of magnesium has been associated with alcoholism, diabetes, the elderly and those with GI problems. Diuretics, certain antibiotics, anticoagulants, corticosteroids, and oral contraceptives compromise magnesium status. 8. Zinc promotes wound healing, enhances immune function, deficiency is increasingly common, especially in the elderly, diabetics, vegetarians, and those with poor biochemical pathways. Zinc deficiency is also linked with hypochlorhydria (low stomach acid), excessive alcohol intake, high iron, Alzheimer’s, hypertension, anorexia, bulimia, infections (H.pylori, Candida), Crohn’s disease, and digestive dysfunction. Zinc helps stabilize blood sugar, prevents weak immunity, is a precursor to testosterone production, shown to keep depression and anxiety at bay, helpful for acne, eczema, rosacea, diarrhea, RA, macular degeneration, support a healthy sense of taste and smell, optimal adrenal and thyroid function, lipid metabolism, digestion and more! Zinc picolinate and zinc citrate are well-absorbed forms of zinc. 9. Iodine deficiency is rampant in the U.S. An iodine deficiency negatively impacts thyroid function, IQ and ovarian function. Iodine/iodide should be considered for breast, uterine and ovarian cysts, fibroids, fibrocystic breast disease, low energy, hot flashes, weight gain, sinus infections, depression, ADD/ADHD, heart disease, increased LDL cholesterol, infertility, cognitive decline, estrogen dominance, radiation exposure, and breast, ovarian and prostate cancer. Fluoride, bromide and chlorine displace iodine in the body. 10. H2O – Water! Dehydration is a cause of many ailments such as low back pain, cravings, dry skin, fatigue, UTIs, kidney stones, headaches, constipation, increased cortisol, dizziness, weakness, poor concentration, toxic buildup, anxiety, and irritability. So, drink up! Test to Assess – Don’t Guess! One of the best ways to determine your unique nutrient deficiencies and balance your body chemistry is with a functional blood chemistry analysis. Quality nutrients from supplements can be highly beneficial in correcting nutrient deficiencies. Are you low in the “happy” hormone?